Fine art, Illustration, graphic design and the art philanthropy of Sam Morrison: Frozen Lake Graffiti!? 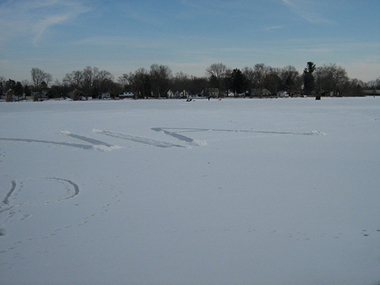 Frozen Sunset Lake (in Vicksburg, Michigan) has been the scene of some tagging and "graffiti" lately. 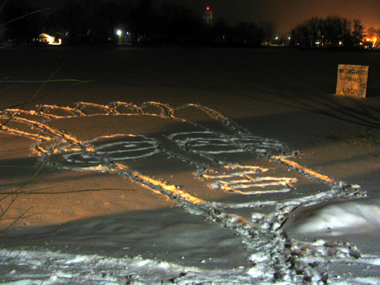 I created the top work of art by walking around on the ice. Normally I shy away from walking on frozen lakes but it's been so cold (for such a long time) that I wasn't too worried about falling through. By the next morning ice fisherman had already drug their sleds over the image.... oh well... it was still really fun to create. Not long after I created my work of art someone else got the idea to tag the lake. (bottom photo) Instead of using their feet they took a shovel and wrote in very large letters "Estefania Needs Husband"... that made me laugh... I think they should get the prize for originality. I thought about doing this a hundred times but it doesn't count unless you do it.